Discussion Does the CalculateGenotypePosteriors change parents' genotype? Does the CalculateGenotypePosteriors change parents' genotype? For example, after the gatk recalibration step, the genotype of a parent, which was 0/0, was changed to 0/1 after running CalculateGenotypePosteriors? 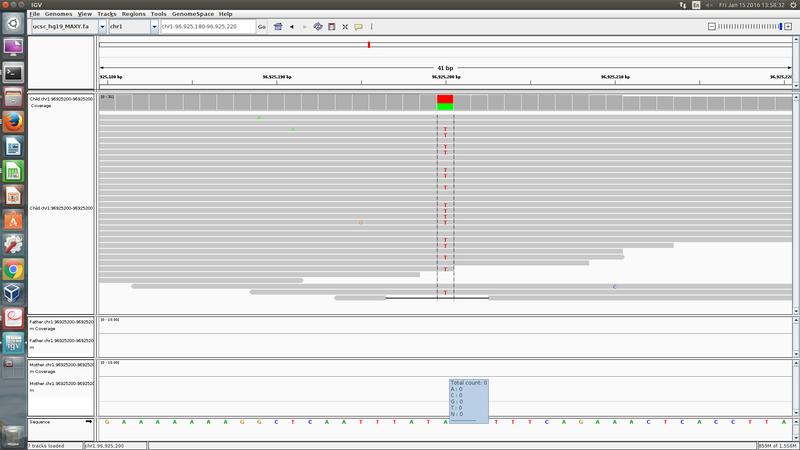 Yes, it is possible for the genotype to change after CalculateGenotypePosteriors. Have a look at the documentation for more information. We analyzed a trio following the Genotype Refinement workflow: https://www.broadinstitute.org/gatk/guide/article?id=4723. We found a weird record. We used samtools mpileup to look at the reads at that location on both parents, there are no supporting reads for alternative allele. Can you tell me how you generated the trio VCF? Also, can you please post a screenshot of the bam file in that region? Please also post the bamout file in the region. Since I made calls by chromosome, I next merged the calls. I will generate the bamout file shortly. If we upload the bamout files, are they private? Basically, there was no reads from mother and father. The uploads go to a private directory that can only be accessed by our staff. We can't 100% guarantee we'll never get hacked, but we do make every reasonable effort to prevent data leaks. And we do delete user data when we're done with it, unless we are explicitly given permission to use some of it for systematic testing purposes. Ok. How to upload the files? If you post the bam file screenshot to the forum, they are viewable by the public. Geraldine is referring the uploading to the FTP when we ask you to upload a bug report. For now, I am requesting a small screenshot of the bam file and bamout file of the region in question. I want to see why the call was changed from homozygous reference to heterozygous. To do that, I first need to see what the region looks like in the bam file. The GQ from HaplotypeCaller is 34 which is not very high, so I wanted to see what is going on in the region. How do you know for sure the mother is homozygous reference? To upload the files, you can click on "Attach a file" below the comment box. Then select the screenshots you would like to upload. We really prefer this way because it is easy for us to view, and the region is not easily identifiable. However, if you prefer to keep things private, you can submit the files to our FTP. Instructions are here. You don't have to submit all the files required in the instructions, just the relevant bam files. Here is the screen shot, as I mentioned before there is no reads from mother. And one thing, when I used the -bamout option, I did not use -nct 8; the program says it does not support that option with bamout. BTW, the last three columns are in the order of child, mother, and father. Do I need to upload more data? Sorry for the late response. I need to think about this/check with the team. I will get back to you soon. Sorry, this dropped off my radar. Thanks for the reminder. It seems the mom's GQ was not super high originally, and the CalculateGenotypePosteriors math showed evidence for the change. There is really strong evidence in the offspring for the variant, and the mother's GQ is relatively low. If you are concerned about this behavior, you can try lowering the de novo prior.